To keep mobile phone in use nobody can deny mobile charger importance but, if you are on a trip and there is no electricity around you, then like other electronic items mobile charger would be useless. Now a days many countries has also power issues and they don't seem to going to solve soon however, at least you don't need to worry about mobile phone charging. 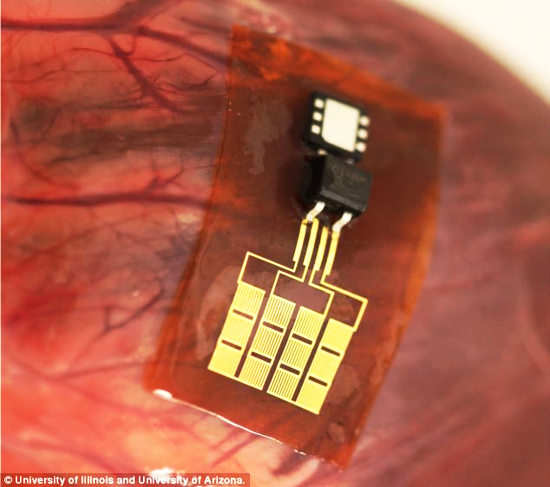 Because probably the future smartphones could get charging straight from your heart beat. A combined team of researchers from China and United States has developed a quite thin battery, implantable in body and, it is responsible to supply electricity to Pacemaker. This quite thin battery can produce electricity by converting a continuous vibrational movement either of lungs, heart, or even of a Diaphragm (a thin muscular sheet forming a partition in between abdomen and thorax). According to developers this technology can also be used to power the other electronic gadgets like cell phones. The implant is made up of a bio material (plastic), and contained Lead Zirconate Titanate Nanoribbons consisted very small sized Piezoelectric power generating plants. This implant also contain an integrated rectifier to convert electric signals (AC) into direct current to flow in one direction with in a rechargeable battery. Till now this technology has tested successfully only in cows by implanting two batteries at the same time on a single heart to accumulate the maximum output energy. And hopefully at first this technology will be use to provide electricity to medical devices. According to the developers of this technology that, currently various kind of medical implants are in use that requires a continuous source of energy to keep them working. These medical implants include implantable cardioverter defibrillators, heart rate monitor circuits, neural stimulators, and pacemakers. In future if any of these devices can get power straight from body's natural vibration than this implantable micro battery would be a winning alternative. Specially for developed countries where some new generation consider even mobile chargers as a bulky burden. On the other hand I'm quite sure that many people would feel fine with wireless and wall outlets for charging mobile. Well there is also a little suspect that such kind of implants can cause some bad effect on heart performance after certain time period. Well, never heard of this thing as heart beat charger. But it sounds well and interesting and very possible. Great sharing.